This week I wanted to say HAPPY THANKSGIVING to you. No matter where you are in the world this day is based on GRATITUDE. Here are some things I am grateful for today. 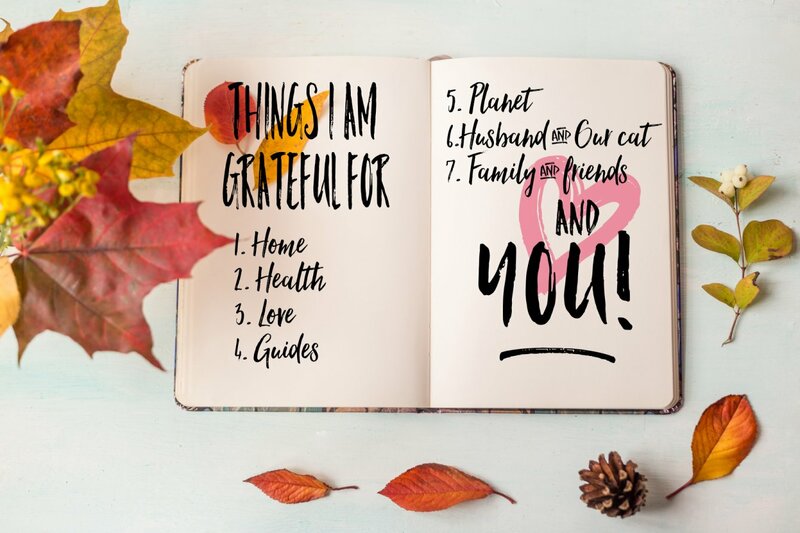 Let me know in the comments below What YOU ARE grateful for? I am grateful to live in a place where there is no war. I am grateful for all the love in my life. I am grateful that I have a close connection with my guides and loved ones in spirit. I am grateful for the planet, the sun and all the celestial bodies that guide and support me every day. I am grateful for a loving husband, a wonderful home and our cat Grit. I am grateful for my family and for all the amazing friends I have. I AM GRATEFUL FOR YOU! It's because of you that I am here. I'm thankful for you Elizabeth Harper and all you do and share!!!! I am grateful for my children's father. He is a good father. I am grateful for my retirement and the job that helped me get there. I am grateful for my health and all the blessings for the past 67 years! It has been amazing and I am so grateful! Beatrice I am grateful for the new me. I am grateful for learning to know the real me. I am grateful and thankful for my beautiful daughter who encourages me in everything thing. I am grateful for a new beginning. I am grateful for the abundance in my life. I am grateful for learning and loving those I think have wrong me. I am grateful for letting go of all the toxic in my heart and life. I am grateful for the universe the moon the sun the stars plants and animals they are all very beautiful of creation. I am grateful for the angels and light beings that surround us every day. I am grateful for friends and family and I am grateful and thankful for people like you who brings hope and love for all. Happy thanksgiving. DorothyVoulgaris I am grateful for the love of my family and friends. I'm also grateful to be alive and to be a mother of two most beautiful precious gifts given to me in stewardship services by God, my daughters. And the most amazing blessing my husband. thank you for allowing and reminding me to look at and be appreciative of the blessing given to me. may god bless you and smile upon you Mrs.Harper Love always DorothyV. I am so grateful to have god and all the angle helper to help me and every one else who asks for them. I am so grateful for having a job. I am do grateful for having my dog shep in my life now departed. for my home and everything new that is comming in my life ..thanks to all who makes a better place in the world . Janet I am grateful for your inspiration Elizabeth...Grateful for my wonderful daughters and grandchildren ..my health ..and living in a beautiful part of the world...my friends...my home .my car ...and my life ?. Donna I am grateful for my daughter who despite her limitations fills me with hope and joy. I am grateful for my son and daughter in law as they have blessed me with 3 beautiful grandchildren. I am grateful for my memories of my loving husband even though I miss him every day. I am grateful for family and friends that keep me going. I am grateful for the challenges I face that help me learn something new each day. I am grateful for prayers and being able to ask for peace on earth. And I am grateful for you too Elizabeth as your wisdom has given me much to think about and makes me calm. I love you. Trang Thuy Nguyen Even though I didn't find it very interesting to read, I read it because it was e-mailed to me for a purpose from the universe. It's to remind me to be grateful for everything I have, not ungrateful for what I don't have. And this is how I felt especially yesterday because it was time where all of my burdens are buried deep beneath my subconscious. Last night as soon as I hopped into bed, I asked my spirit guides if I was on the right track because it didn't felt that way yesterday. Your e-mail is the answer is to remind me to be grateful for everything I have. Marissa I am grateful to be on my journey of healing, both myaelf and others. I am grateful for grief, teauma and other potentially negative life changes, no matter how challenging. I am grateful to have an open mind that only yearns to be stretched wider. I am grateful for my Nanas journey, though her physical journey ended in July, she taught me how to be a good human and love imperfection in people. I am grateful to have people to miss. I am grateful for reminders like these to be accountable and recollect often the many events and people to be grateful for. I am incredibly grateful to receive your love letters and learn from you, I don't have to feel like a freak because I am so spiritually connected. I am grateful to feel like a beautiful freak of nature, more often thab ever before. I am grateful for my aching heart learning to mend itself spiritually first this time. I am grateful to learn how to wield energy instead of soaking it up or giving it all away. I am SO VERY GRATEFUL for the support of my beloved and our sweet daughter. They love me through all my emotional/spiritual/physical ups and downs. I am grateful for resilience, conviction and malable humanitarians. I am grateful for BEING. Arnie I AM GRATEFUL for my mysterious and magickal life!!! I AM GRATEFUL for every breath that I take of clean and refreshing air!!! I AM GRATEFUL for my amazing creativity!!! I AM GRATEFUL for my charm and grace!!! I AM GRATEFUL for my eternal and precious life!!! I AM GRATEFUL for my constant enthusiasm!!! THANK YOU!!! THANK YOU!!! THANK YOU!!! I LOVE YOU!!! I LOVE YOU!!! I LOVE YOU!!! Today I am grateful that I was able to massage my mom's feet as she starts her journey back to Spirit. I am grateful that I was able to spend 4 days with her before she forgets who I am. How lucky I am. And I am grateful for the help I received from friends and family for providing transport and a place to stay while I spent time with her. Thank you. Kimberley Kendall I Am grateful for. . .
?having a family that support me.
? My amazing Shih tzu and love of my life Nikkinoo.
? Having a job that I absolutely love doing.
? The small group of true friends I have.